At $135 for the round trip, I was persuaded once again to take an AAmericAAn AAirlines AAluminum tube to MilwAAukee AAnd drive in to Oshkosh from there. I didn't like that last part. Boy, was this a nicely weathered airshow! Natural air-conditioning from sundown til mid-morning with 85ish highs in the afternoons. Two nice years back to back! Imagine. 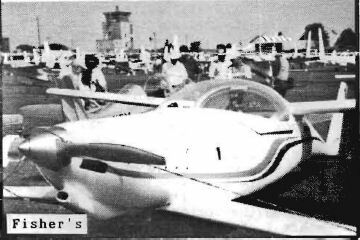 The weather south of OSH and around Chicago made arrival a bit tricky for sportplane pilots, but they got in just fine. Here was the count of Q-types as I left Wednesday morning. 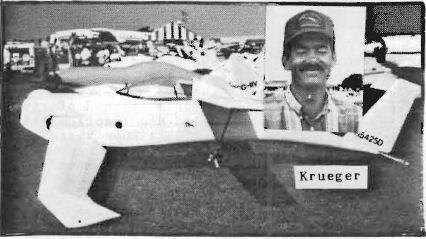 Note that we had a classic on the line: Krueger's Onan Quickie (Lipke, a Cheesehead too, usually has his Onan Quickie stashed in show aircraft camping, but he came on 4 wheels this year). 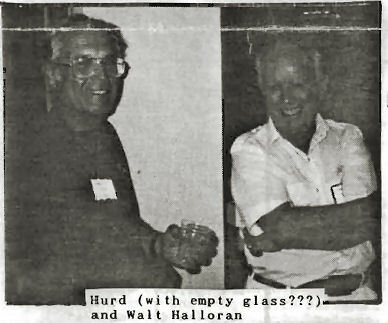 Walt Halloran was a new-show this year. His TD converted to Tri-Q was sporting the only Revmaster powerplant. And ... he says he hasn't had to adjust his valves in 82 hours thus far. And ... he's happy with this engine though he doesn't know just what the former owner, Wes Foss, did right. Two other Oshkosh newbies were Canadian George Bell with a knock-your-eyeballs-out goldenrod yellow paint job and Bill Slattery, a late Tri-Q arrival unknown to me (it looked a bit worn, but he was there, where were you?). 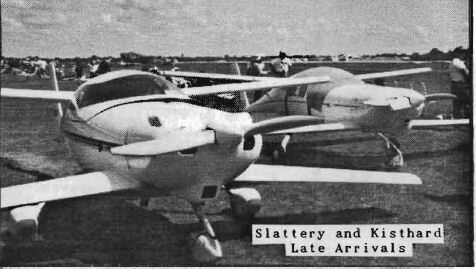 Slattery was gone the same Tuesday he arrived. Charlie Harris was back with his hot rod and high timer of the show. Rose was in from California with a fresh coat of Ditzler Deltron urethane spiffing up his Tri-Q and lanky Jim Doyle was back again, even sleeping in his Tri-! for gosh sakes. Somebody should develop a sidecar for Last and Fisher who flew in while their families arrived by other means. And get this; Shapley arrived 20 (!) mph faster this year thanks to a prop pitch change and some other small refinements. 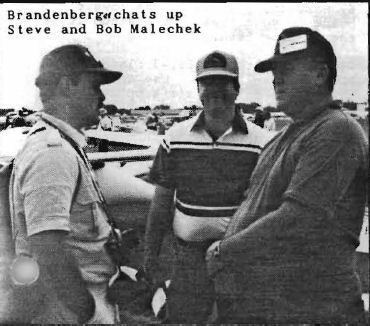 Malechek did only a R.O.N. in his beauty. He wanted to beat out some weather moving toward Texas. It's nice to have a ship fast enough that you can make Oshkosh a "day" trip if you wanna. 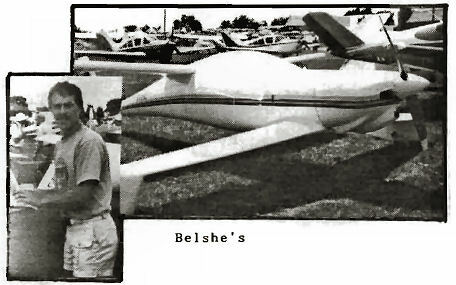 Belshe is continuing to prove that the GU canard sitting behind an O-200 powerplant is just no big deal. All he did was to move the axles forward (as prescribed for the LS), and add sparrow strainers. QBA ACTION - This was the second time in our history that scheduling demons caused us to have a Saturday night Wine 'n Cheese party and Sunday Forum instead of the other way 'round. Pavlov's dog theory still works. Habituated QBAers didn't know where to go when. Never mind that the changes were all documented in the last newsletter. Honestly, I don't know how some guys can build from reading plans. It don't seem they can really read to me. Mebbe I need to go to a video format ..... not. Of course I fail to mention that the convention program got the party date wrong too. 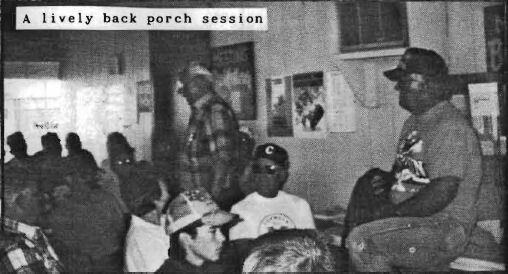 Anyway, about 25 guys showed up for the porch meetings on Sat. and Mon., over 100 found the forum on Sun., but for the first time ever we didn't finish all the wine and cheese. Drats! Nobody who showed up at these events was disappointed. SCATTERED PIECES - We got a Sheehan report. In June he was seen at Mojave working on some weird stainless steel (?) 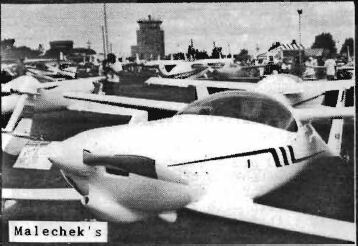 transport-type aircraft (don't ask me ... I just pass these reports on like I get 'em). The work must keep him from answering his phone, according to a few guys who've tried. Scott Swing is still offering the Tri-Q mod for some $1,900 now. He and his dad, Duane, have bought out the Velocity program and will eventually move to Sebastian, Florida to keep kit production spooled up. Scott's wife, Amy, has production spooled up on the second 9 month homebuilt of her own, for those of you who appreciate knowing such things. Custom Aircraft Components is no more. A former QBA advertiser, they used to offer aftermarket Q do-dads and construction assistance. T. J. Wright, a former principal, said he may have some helpful bits and pieces available after the financial smoke clears. Rutan seemed to be setting off alarms this year. He's very sensitive now to warning builders about delaminations of glass to foam bonds. He advises pilots to do a pre-flight to include tapping over the airframe with a coin to locate 'dull' areas which may indicate a de-lam. A recommended fix is to drill small holes around the de-bond perimeter and inject epoxy into one side until it oozes out the other and then let it cure under a weighted object. Delamination can occur from hits on the structure (hail, dropped tools, etc.). Mike Melville even suggested that leading edges should be filled with flox instead of micro to add impact resistance in a vulnerable area. Rutan is also concerned about the type of foam core material that has been used. NOT recommended is the buoyancy billet, which seems to have less density and less uniformity. Of course, since this is generally cheaper stuff, some guys have used it. OTHER OSHKOSH DELIGHTS: Awaiting a plane change in Chicago, I was accosted by an FAA-MIDO inspector. Must've been the festooned ball cap that attracted his eye. He was on his way to OSH too (and accosted is an exaggeration) where he was support staff for a proposed certification program for homebuilts. Hmmmmmmmm, I thought, wonder what's up. Turns out that 14 folks applied for approval to manufacture airframes and engines under this new program. You'll know the names: Van's Aircraft, Lancair, Mosler, Rotax, Avid, etc. 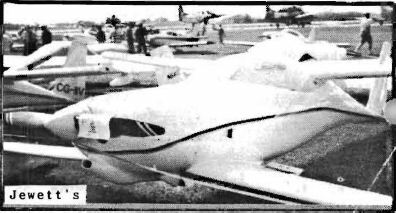 The expectation is that the first production certificates will be awarded as early as '93 Oshkosh (it'll take a half ton of C-4 explosive under a passel of FAA hineys to get THAT done, at least from MY experience). If anybody's following the saga of the P-38 squadron that was buried under the Greenland ice cap, the recovered pieces that were to be shown at OSH didn't show - or at least I wasn't able to find them. 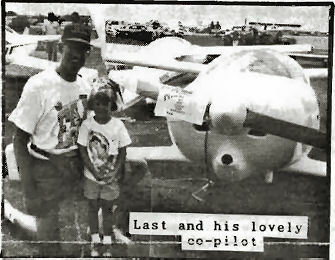 A saga that DID show, was the BD-10. And Jim Bede is BACK! Resplendent in all his charisma, Mr. Short Stuff has not lost a bit of his charm. He held an overflow forum crowd just as spellbound as former employee Rutan did. The 10 had flown 6 times by then (full videos for the unbelievers) and from the audience questions, JB knows the airplane from pitot probe to tailpipe ... as usual. For those know-it-alls who question his engineering ability, he did the job and is now thumbing his nose ever so politely at the critics. Half a mil per copy. 6+ orders in hand. Wheeeww, this report is running long, I have more to say, but I gotta stop here with a brief personal note. This has to go out NOW with the details of our KS meet coming up. It is already FAR delayed because I decided to go to Miami for my birthday, celebrated with my family. I thought I'd be able to finish this up there and have it ready for printing when I got back. UNfortunately, my birthday fell on the weekend of "Andrew's" arrival. Out went the electricity, the airport, etc., etc., You know the story. But I'm still here to write this (even though my mood is not at its best). Thank the Lord for small favors! You can order a PDF or printed copy of Q-talk #34 by using the Q-talk Back Issue Order Page.